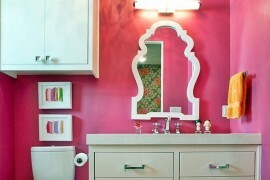 When updating your bathroom, the smallest details can make a huge impact. Paint, tile and lighting are all great tools in a large-scale bathroom remodel. But sometimes all you need is a little tweak here and there to freshen up the space. 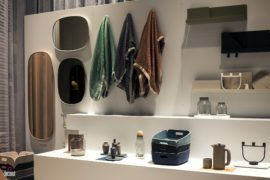 One feature many design lovers overlook is their towel rack. 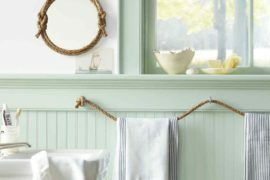 Hang your towels in style with the help of one of these towel rack DIYs. 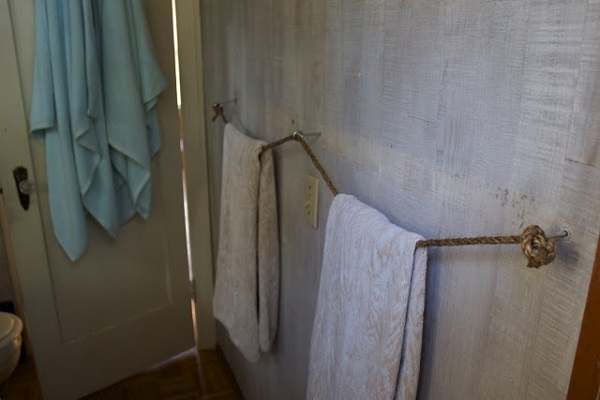 If folding your towels in a neat row just isn’t your style, abandon the traditional rack for a set of decorative hooks. 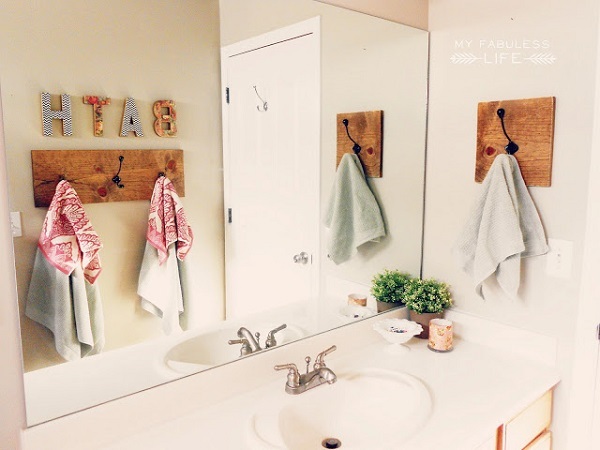 This DIY from My Fabuless Life brings casual elegance with mismatched hooks and medium toned stain. For a shabby chic touch, sand the edges slightly. 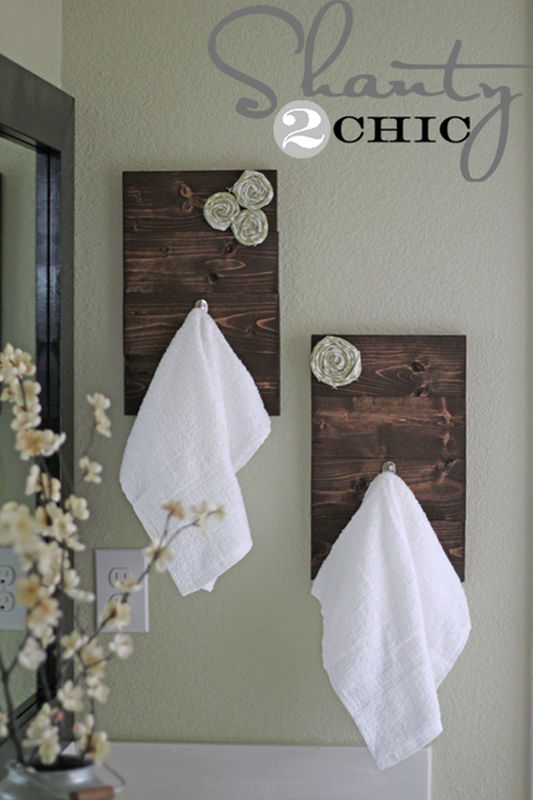 Need a spot to hang hand towels too? Create a smaller rack and position it beside your sink. This will free up more space for your regular towels, and you’ll have easy access when you need to dry your hands. Start your day off right with a little sunshine- paint, that is! 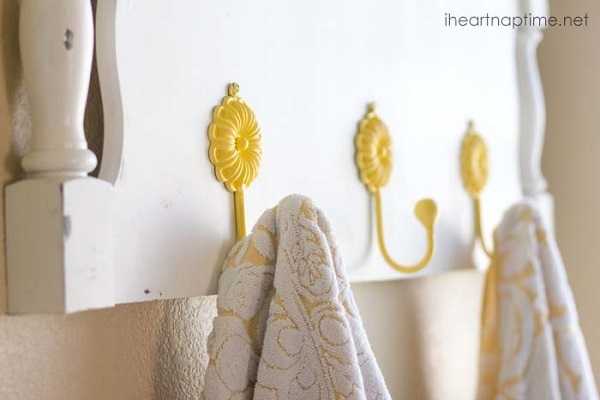 This eye-catching towel rack from I Heart Nap Time became the focal point of the bathroom with a pop of bright yellow paint. If you decide to use a headboard for your own project, match the style to your bathroom’s existing decor. A headboard with ornate carvings would work well in a more traditional space (think Victorian), while clean lines are better suited for contemporary taste. 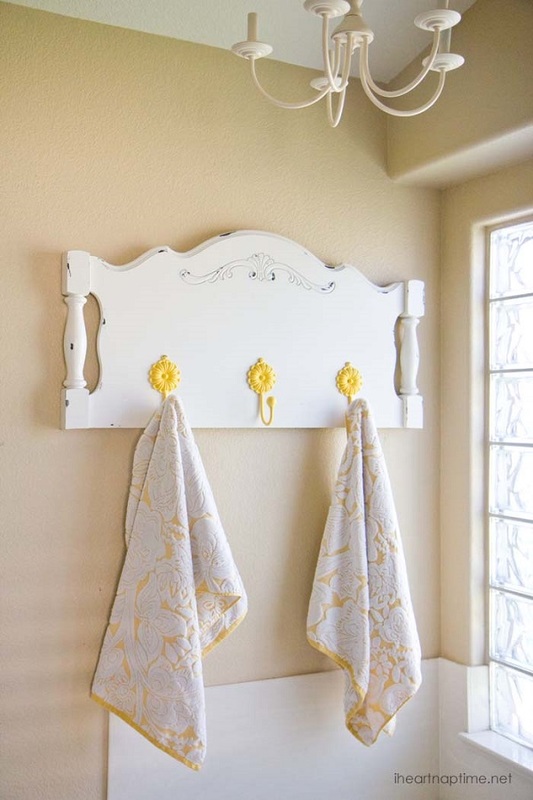 Make your towel racks truly stand out with a few subtle details sure to stand out. This DIY from Shanty 2 Chic plays up the beauty of dark stained wood with some fabric rosettes as accents. Rosettes are a great way to tie together the color palette of the room. Choose fabric that coordinates with your towels, rugs, or paint for a unified design. Bring in a new element of relaxation to your bathroom with this beach inspired DIY from On My Honor. 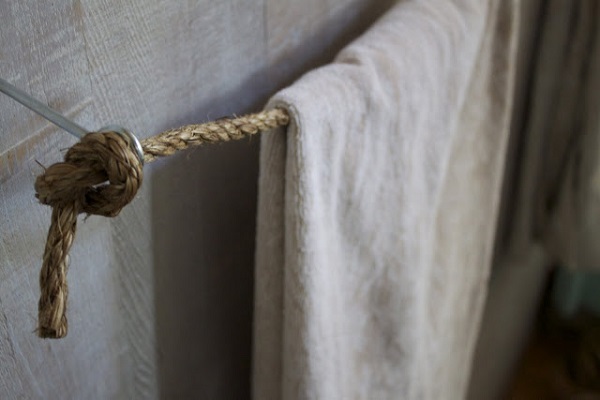 A few feet of rope or jute become a perfect towel rack fit for a day out at sea. To further accentuate the nautical feel, tie a few knots on the end and secure with a little glue. When hanging your rope, be sure it is taunt enough that your towels won’t touch the floor when hanging. 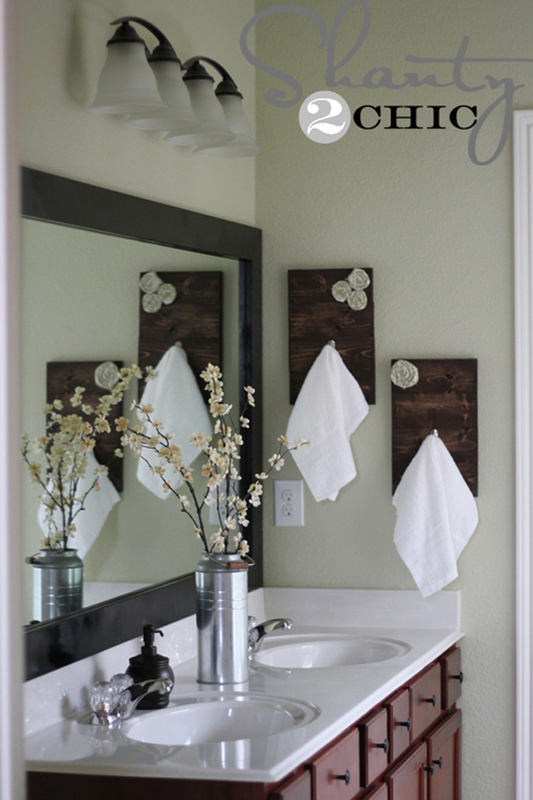 Wood palettes and crates become towel rack genius with this project from A Beautiful Mess. Recreate this look with antique crates from a thrift store, or age new crates by sanding them and applying a stain. 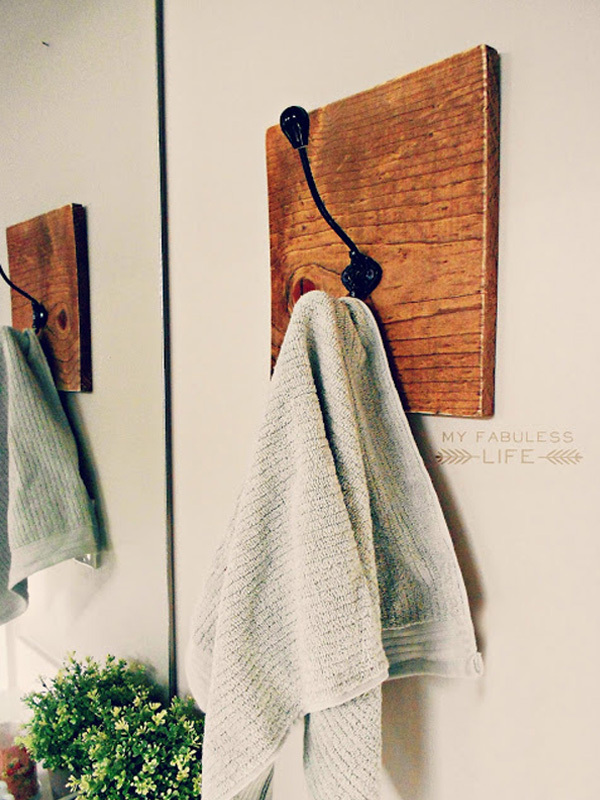 Turn a palette on its side and mount on the wall, then hang your towels on some simple brass hooks. 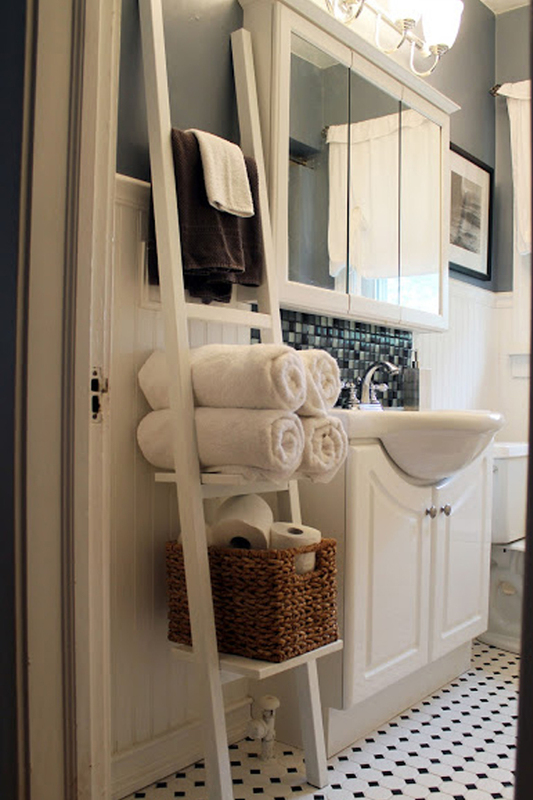 Use the stacked crates as storage for extra towels and other bathroom items. Whenever you think of a wine rack, a bathroom usually doesn’t come to mind. Not the case after seeing this DIY from Thrifty and Chic. 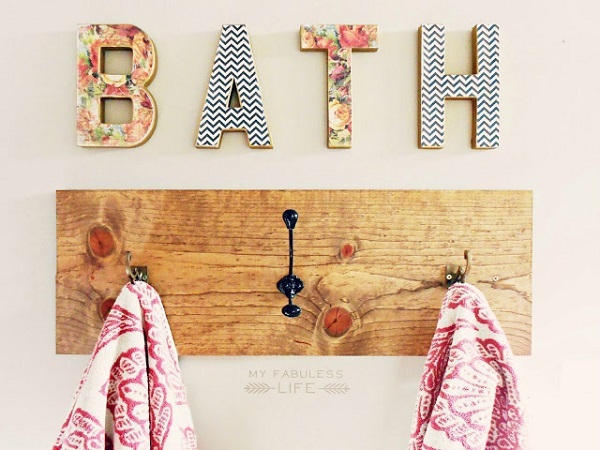 Sit your rack next to the tub for easy access while taking a bath, or place it in a corner to maximize unused space. 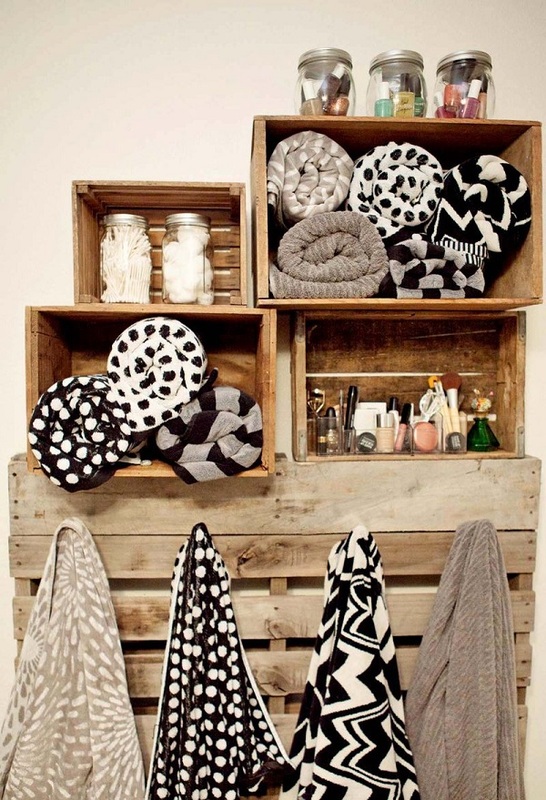 Who ever thought a wine rack would be the perfect home for your towels? A little effort can go a long way when updating your bathroom. 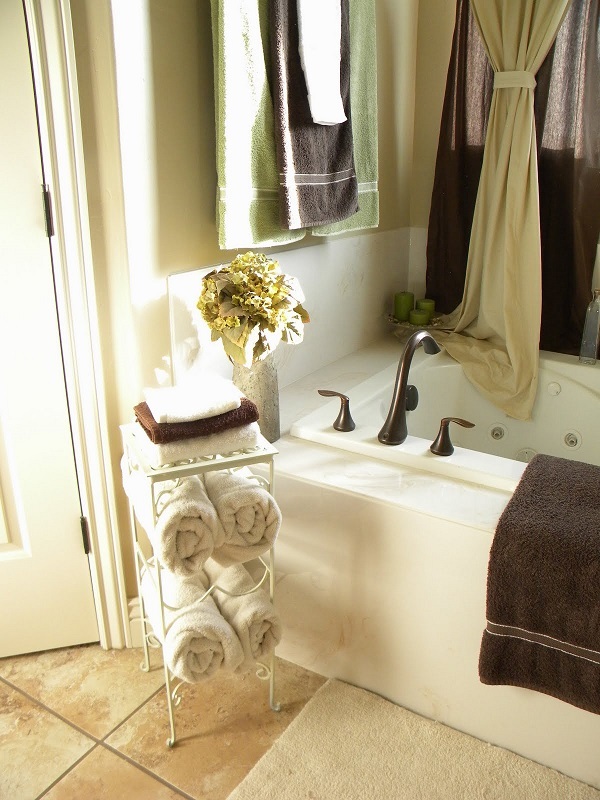 Just a simple change in towel racks can create a relaxing and stylish space. Did any of these DIY projects spark an idea? Tell us so in a comment below.